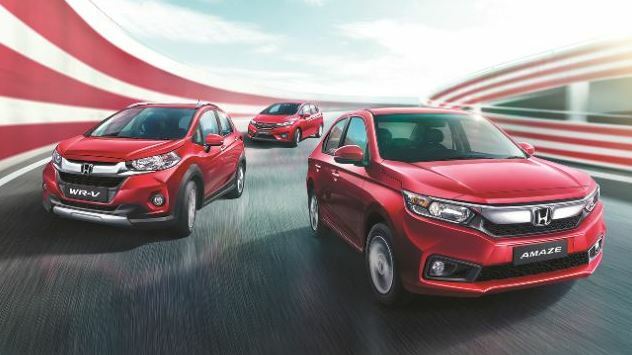 Honda has launched ‘Exclusive Editions’ of the Jazz, Amaze and WR-V in India. These limited edition cars will be available in red & white body colour options only, and are now on sale across all Honda car showrooms. The ‘Exclusive Editions’ comes with changes on the inside and outside, to help differentiate from the standard variants. The Amaze ‘Exclusive Editions’ comes in VX trim in both petrol and diesel manual gearbox options priced at INR 7.86 lakh and INR 8.96 lakh. This is an additional cost of INR 12,000 for features such as dual tone alloy wheels, new black PU seat covers, front armrest with slide and storage, step illumination garnish & ‘Exclusive Editions’ badge. The WR-V ‘Exclusive Editions’ comes in VX trim in both petrol and diesel manual gearbox options priced at INR 9.34 lakh and INR 10.47 lakh ex-showroom. This is an additional cost of INR 18,000 over the standard VX grade for features such as black painted tail gate spoiler, body decals, black PU seat covers, step illumination garnish, ‘Exclusive Editions’ badges. The Honda Jazz ‘Exclusive Editions’ comes only on the petrol VX CVT variant priced at INR 9.22 lakh which is an additional INR 19,000 over the standard model. Features include black painted tailgate, black alloy wheels, body decals, seat covers, step illumination, ‘Exclusive Editions’ badges.